You are here: Home / Blog / Is Dispersed Camping in the Boondocks Safe? Is Dispersed Camping in the Boondocks Safe? 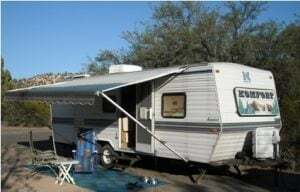 First – A RV is much less tempting to a thief than a permanent residence, it is unlikely to contain the same amount of easily pawned appliances, jewelry or other valuables that can be easily converted to cash. 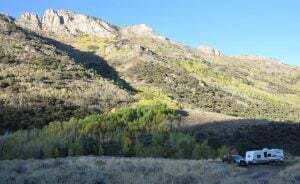 Second – Boondocking off a back country public road makes you no more of a target for a crook than anyone who lives in a home on a remote country road. Third – Criminals are opportunists, they apply their craft where there is maximum opportunity such as urban areas, campgrounds and other locations people congregate. Think about it, why would a criminal trek miles out in the middle of nowhere with the anticipation of finding someone camped in the boonies to victimize. system and no criminal wants to be bitten by one. dish outside your RV door as shown in the photo below. – Park where there is cell phone service when possible. – If you are a motorhome owner, keep the jacks up, awning in and your RV ready to roll. If you are ever threatened you can just jump in the driver’s seat and leave. – If your RV is equipped with a remote key fob, keep it readily available. The panic button would scare off most any criminal. The honking horn and flashing lights can be seen / heard for miles. – Carry a device like a Spot Messenger or DeLorme inReach. Both allow you to summon help where cell phone coverage in unavailable. 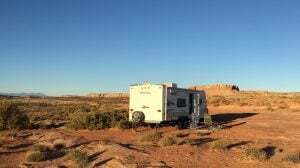 Finally – Talk to other RVers that disperse camp on a regular basis. They will gladly share their experiences and recommendations for camping in the boondocks, you will quickly learn there is nothing to fear. Note: Many RVers arm themselves with a firearm or less lethal protection such as mace, bear spray, pepper spray or wasp spray. There are legal ramifications for using / possessing each of these items, so know the laws and act responsibly. If you chose to arm yourself by all means get professional training on how to use firearms for self-defense. If you chose not to arm yourself at least get an NRA sticker to put on your RV (criminals hate armed victims even more than dogs). Thomas, I don’t consider staying in rest stops dispersed camping in the boondocks. But as mentioned in my blog, anywhere people congregate (including rest stops) are places where criminals apply their trade. I agree 100% with you, if you choose to carry a firearm, get trained, know how to use it and know the law! Nice article Dave! My wife and I volunteered with the USFS in Wyoming Wind River Range for several years, including two as rangers. We monitored dispersed campsites for the usual (unmonitored fires, food left out and other bear attractants). In all that time I can’t recall anyone being victimized by either theft or assault. We saw unaccompanied females as well as senior citizens safely boon docking in beautiful, secluded sites. I agree it pays to be prepared for the underbelly of human nature but I certainly wouldn’t let that stop me from enjoying the beauty of a secluded natural setting! The only people we saw injured were victims of their own bad judgement.